Cole Hamels has pitched in plenty of big, meaningful games in his career, and he'll have another on Wednesday night when the Rangers look to win a series in September against a team they should win series from, and in turn, keep the pressure on Houston, Los Angeles and Minnesota. Looking back on Hamels' recent outings, it's pretty clear he's in for something special as he returns to his hometown of San Diego to face the revamped Padres. Hamels has been great at Petco Park in his career with eight starts under his belt, compiling a 5-1 record and a 1.78 ERA. But all of that is only a portion of the reason you should be excited for what's to come in the rubber game of the series. 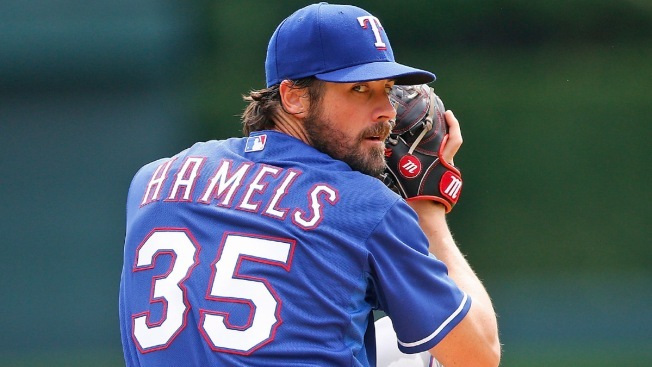 Want a reason to get really fired up for Hamels' sixth start as a Ranger tonight? Look no further than his last six starts. Of course, we all know his last start before the big trade to Texas was his first career no-hitter against the Cubs. Then, he was dealt to Texas and his first five outings in a Rangers uniform went like this: five earned runs allowed, four earned runs allowed, three earned runs allowed, two earned runs allowed and most recently one earned run allowed in an eight-inning gem against the Orioles.